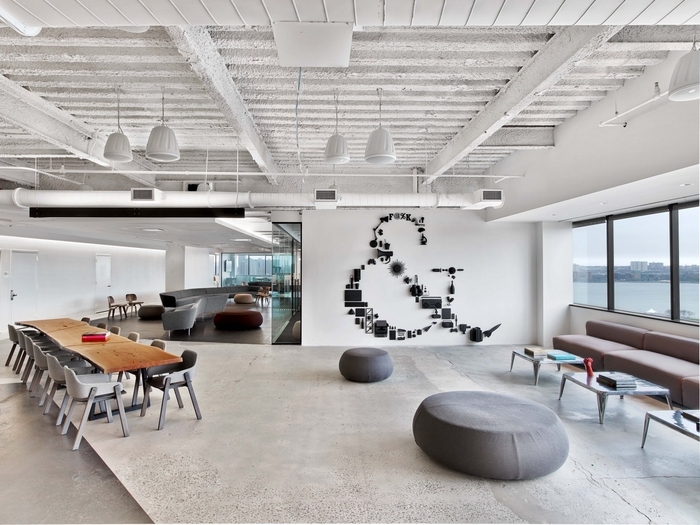 M Moser Associates has designed the new offices of global communications and ad agency Saatchi & Saatchi, located in New York City, New York. M Moser assisted Saatchi & Saatchi with evaluations of densification strategy to consolidate their business units into one floor by utilizing an open floor plan, which allowed for a series of collaborative spaces. The overall goal was to achieve a new space that was edgy, modern, and fitting of their creative brand. Existing office fronts were removed to contain costs, thereby creating open rooms on the perimeter. The walls provided ample opportunity for the creative staff to pin up work in process and display their creative efforts with the staff. The interior open plan has a floating linear slot wood ceiling strategically placed to create hub areas where collaborative spaces have been created. Shared conference room and meeting areas were dispersed along the perimeter to provide spaces with acoustical privacy and balance the open floor plan. The main café space has been located on the west side of the floor at the perimeter windows for sweeping views of the Hudson River.